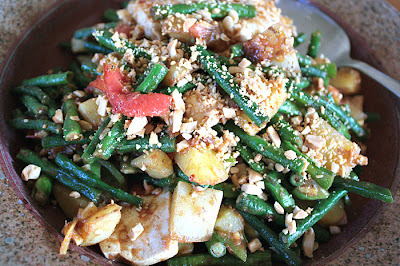 The long bean dish looks great...and very healthful! I'd like to try it sometime. Thanks for sharing, Andrea. The long bean dish looks delicious! I haven't gone to the farmer's market much this year (it's kind of far since I moved), but I was there a lot last year and it was always SO busy early in the morning. It was always worth it though. The long bean and tofu looks amazing. How do you think a yam or sweet potato will be in place of the white potato? You're welcome. It's fun to try unusual ingredients. 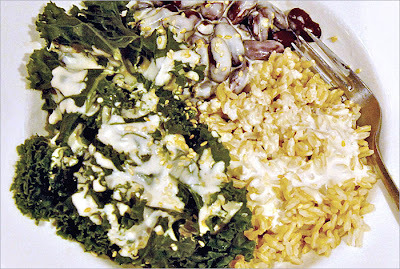 Will you miss particular ingredients when you leave Hawaii? When I used to go to the downtown market I'd find myself moving through the crowd like a zombie, never getting close enough to the stalls to buy anything! I'm not a big fan of crowds. The smaller markets are great. I think if you're a fan of yams it would be great. You might need to balance the sweetness a bit. I found some long green beans at our farmers market about a month ago. I made a stir fry with mine also. I haven't seen them since that one time though. They were so good. All your foods look so delicious! And I love long beans! The Hmong vendors at the market here have them too, and I can't wait to pick up a bunch this weekend and try your recipe...if it cools down a bit by then, that is. It looks delicious! 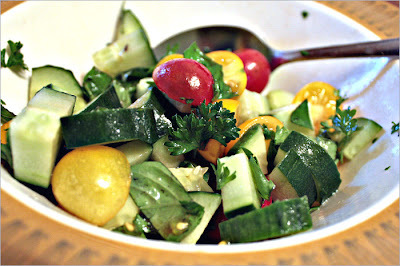 If it doesn't cool down I will have to copy your cucumber tomato salad...you have my mouth watering! I've seen those long beans around, but have never tried them, the dishes you made with them look delish...leftovers included. I'm still drooling over those desserts! Your eggs work for me! 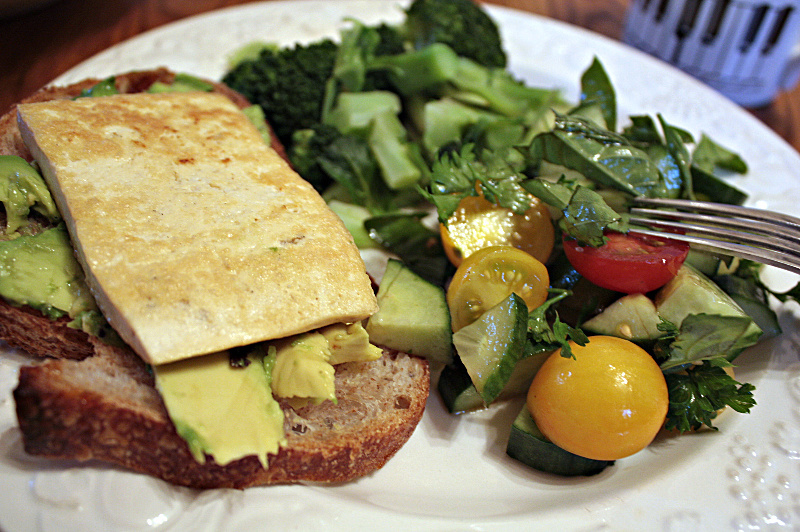 That black salt/tofu mix really *is* freaky, whatever you use for the yolk. 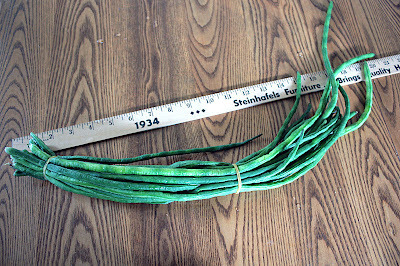 My aunt Katee, a big fan of your blog, saw the long beans and bought some for me today at a market near her place--I've never tried them but am looking forward to experimenting. They'll be the first green or yellow beans I've had all summer, mmm. The long beans seem to have a richer, beanier taste than regular green beans. I'm going to look for them again this week. Thanks for leaving a comment and telling me you live in Seattle! It's nice to "meet" other vegan bloggers from the area. I turn into a zombie if the market is too crowded, and just wander around the square without buying anything! When I go to the downtown market it's just for fun, not food. 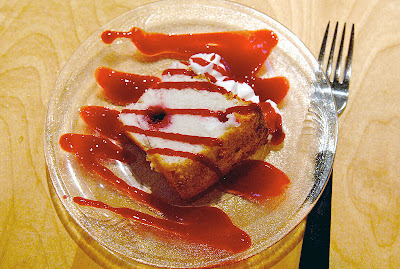 I'm still wondering about that angel food cake. How did they make it look and taste like it was made with a dozen egg whites? cooool! 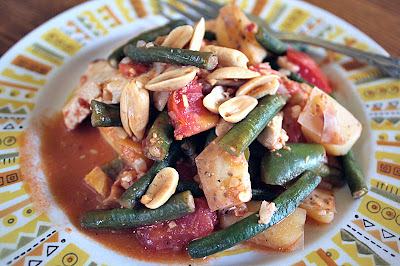 i've never eaten yard long beans before--in fact the first time i saw them was this season in seed catalogues. they're fascinating, i have to try growing some next year. good to know about the texture...do they taste basically the same as regular green beans? 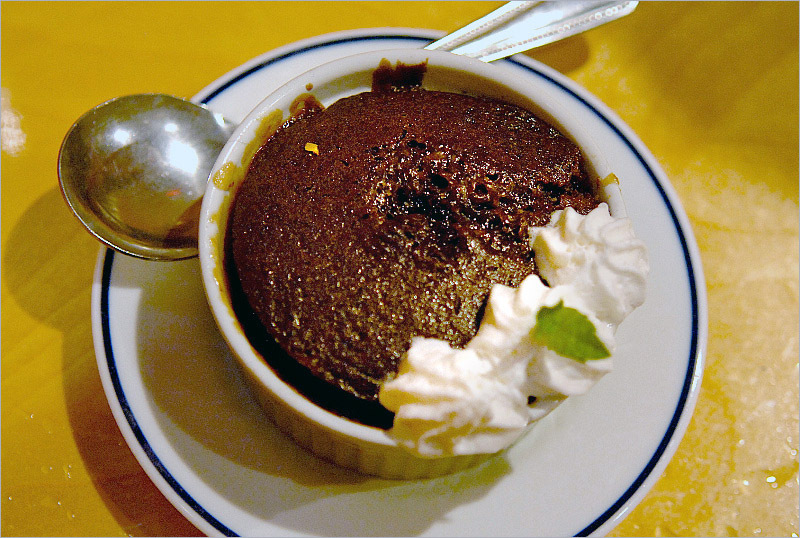 The taste is similar, but different, in a more bean-y sort of way. The texture is a little different, too, both crisp and tender at the same time. I really love asian food but I always have to cook it at home as i'm yet to find a restaurant or takeaway that serves anything that is gluten-free. It's not all bad though as we virtually live off stir-fries with chinese-5 spice! 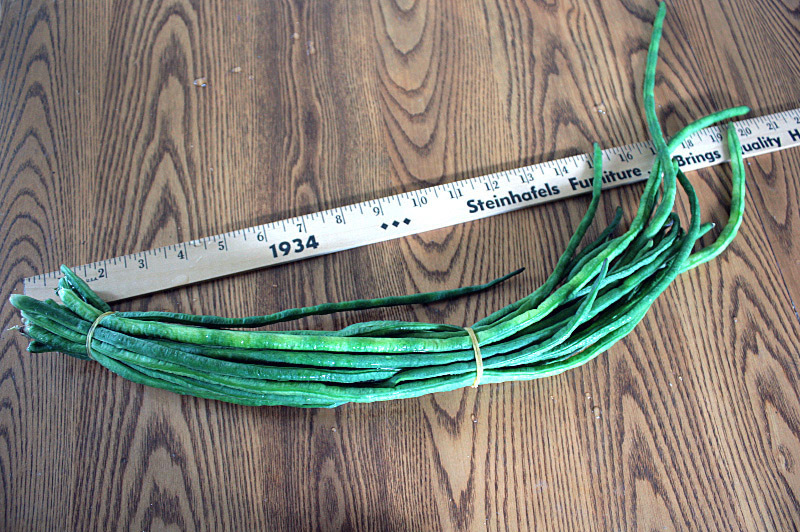 I love long beans - have you tried keeping some of their length in dishes? It's a fun way to eat them. Enjoy your tomato crop! Ours went bust. I always enjoy long green beans at my favorite Thai restaurant, but I'm never adventurous enough to cook with them when I see them at the Asian market. Next time! Meanwhile, I've got to get some black salt; my Daiya is crying out to be part of an "eggie & cheese" sandwich! I thought those were just green beans! But long... I'm so envious of you having that market and ORGANIC veg to choose from! I love Asian cuisine, too, but I'm always worried about fish sauce, salt and fat, making it hard to enjoy restaurant food. Adding gluten-free to the mix would surely complicate things dramatically. Fortunately, more and more restaurants are becoming sensitive to the needs of gluten-free diners, though I suppose this would be mostly in larger cities. Lucky you're such a good cook! 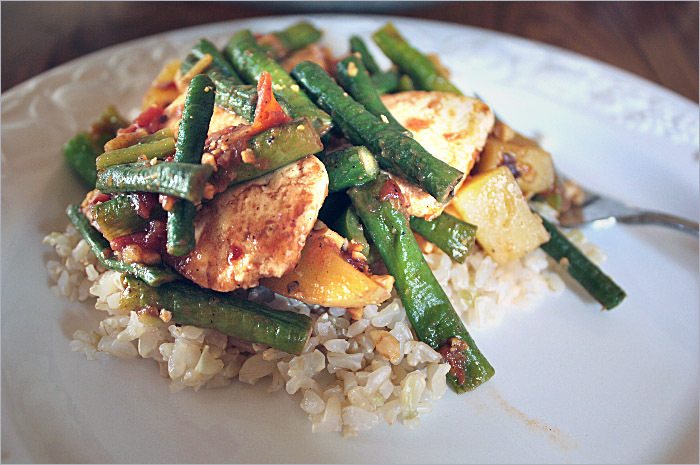 This was the first time I cooked long beans, though I've had them several times at my son's house. He always cuts them into small pieces. They're so long and floppy I thought cutting them would make cooking easier, but I might try them a little longer next time. They were easy — you should get some. I can see the possibilities for creating an egg&cheese sandwich. Make it on a toasted sesame bagel for extra charm! The farmers markets are pretty great. The long beans didn't come from one of the organic stands but I wanted them anyway. If you get black salt, use it sparingly — it's very sulfuric! When you put it on fried tofu, it tastes just like egg. I've never had long beans before, but they sure are pretty looking! Sorry to hear about the angel food cake. That's always a bummer. At least I didn't eat the cake!